Game description: Master your surroundings: Reach new heights with the broadest range of acrobatic abilities and utilize objects within the environment to uncover new paths to explore. Explore epic and unknown worlds: Discover ancient mysteries of the underworld hidden within the coast of Thailand, frozen islands of the Arctic Sea, the jungles of Mexico, and more. Treacherous and unpredictable challenges: Each level is an elaborate multi-stage puzzle masked within an interactive environmental playground offering more flexibility over how the area is solved. New state-of-the-art gear: Utilize the latest technology in Lara's upgraded inventory to navigate the world including: Multi-purpose grapple: A claw-like device with a high-tension cable designed for climbing, rappelling, performing wall runs and manipulating objects within the environment. All-terrain hybrid motorbike: A unique vehicle design built to drive on everything from mud to snow and ice. 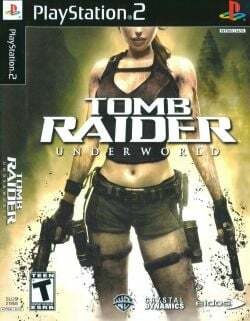 Tomb Raider: Underworld is a single player, action-adventure video game. The game is presented in third person perspective, where the player takes control of Lara Croft. Lara's environment reproduces a more "interactive world that reacts and remembers", such that footprints left in the mud or mud transferred to Lara's knee from kneeling on the ground is washed away by rain, the bodies of the foes she encounters remain where she killed them, and any destruction to the environment she causes are permanent. Ingame is completely corrupt in hardware mode. Looks better in software mode, but still has graphics too distorted to be playable. Description: Major graphic corruption occurs in both Hard- and Software renders. It looks a bit better in the Software renderers, but there's still artifacts and distortions occurring. Basically the game is unplayable because of this while using the Hardware renderers. Workaround: In recent revisions of PCSX2 (at least v1.5.0), the CRC hacks have been updated where this effect is completely skipped, making the game playable while using Hardware renderers. To enable this, go to Config > Video (GS) > Plugin Settings > Set CRC Hack level to 'Automatic (Default)'. Keep in mind that this is not an actual fix but a workaround, it merely makes the game playable, and you're missing out on various graphic effects such as the reddish glow from the fire in the first level, etc.